People ride their motorcycles past a digital billboard showing a sketch of the main suspect in Monday's attack on Erawan shrine, in Bangkok, Thailand, August 23, 2015. 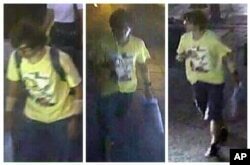 A better identification of the suspect was hampered by broken CCTV cameras in central Bangkok along the main suspect’s escape route. Thousands of dwellings in Bangkok, including guesthouses frequented by foreigners, are being searched for clues in the bombing of a popular shrine one week ago, police said Monday. "There are more than 10,000 places in Bangkok that we have to inspect and search," said Metropolitan Police Chief Lieutenant-General Srivara Ransibrahmanakul. "We may also need to repeat searches at some places." The inspections are part of an operation involving more than 1,000 police officers, soldiers and others intended to boost public confidence in the investigation and reassure tourists the kingdom’s capital is safe. At least 20 people were killed and more than 100 injured in last Monday’s explosion. Thailand’s police force and its military-led government are facing criticism for a lack of progress, misplaced priorities and for issuing contradictory information. Thai soldiers walk outside the Erawan Shrine at Rajprasong intersection, the scene of last week's bombing, in Bangkok, Thailand, Aug. 24, 2015. There have been no arrests of any suspects and officials said they had interviewed only 10 witnesses so far. Officials, speaking to reporters, have acknowledged they are uncertain whether the alleged bomber, tracked on closed circuit television cameras, was a Thai or a foreigner. A better identification of the suspect was hampered by broken CCTV cameras in central Bangkok along the main suspect’s escape route, national police Chief General Somyot Poompunmuang said Monday. “We’ve had to waste time to put the dots together” because only about one-fourth of the cameras were functional, Somyot told reporters. Authorities have contradicted themselves on whether or not the prime suspect was still likely in Thailand. Khaosod newspaper reported the passport appeared to be a fake Turkish document. That has led to speculation the attack was revenge for Thailand’s deportation early last month of more than 100 ethnic Uighurs to China. Chinese authorities have labeled Uighur separatist movements as terrorist groups, but none have been known to conduct any attacks outside China. Also, no organization has made any claim of responsibility for the bombing at the Erawan Shrine. FILE - This image, released by Royal Thai Police spokesman Lt. Gen. Prawut Thavornsiri, shows a man wearing a yellow T-shirt near the Erawan Shrine before an explosion occurred in Bangkok, Thailand. General Somyot denied the force had any such information about Museyin and also said he was unaware of a Japanese media report stating authorities had identified a Spanish man as a suspect. An arrest warrant was previously issued for an unnamed man based on a sketch made from the CCTV images. Authorities are also investigating CCTV video showing a different man dropping a package into the Chao Praya River from a bridge adjacent to a pier around the same time as the bombing of the shrine several kilometers away. There was an explosion at that spot in the river the following afternoon but no one was injured. Government officials initially rebuffed offers of international expertise to assist with the investigation of what they are terming the worst-ever bombing in Bangkok. Police now say they do not have the desired sophisticated equipment and that “cooperation” from foreign countries would be welcome. Other counties “use biometrics systems, which consist of fingerprints, facial and iris recognition, which Thailand doesn't have at the moment,” Somyot said Monday. Since the attack, three people have been arrested: two Thais for spreading rumors on social media and a Hong Kong-based photographer, Hok Chun “Anthony” Kwan, for attempting to take body armor and a helmet on a flight home from Bangkok after covering the aftermath of the bombing. A statement from the Foreign Correspondents’ Club of Thailand (FCCT) declared it was “dismayed” by Kwan’s arrest and urged authorities not to press ahead with criminal charges against the photographer, who could face five years in prison for violating the 1987 Arms Control Act. “However, the use of body armor and helmets is routine by journalists around the world, and is clearly to enable them to do their jobs in dangerous situations. The deaths of two foreign journalists in Bangkok from gunfire during the political unrest in 2010 underscores the need for this kind of protection,” the FCCT said in a statement.